AEC Digital Solutions is one of the preferred options for Scan to BIM Services. We have successfully finished several projects in Revit to generate the BIM Model out of a point cloud with billions of data points, collected with 2mm precision by the surveyors. With proficiency in Scan to BIM, AEC Digital Solutions LLC addresses an expanding market opportunity for all 3D laser scanning and building information modeling. Our Scan to BIM services are entailed by leading architects, builders, contractors and construction companies for preparing a variety of models of Architectural, Structural, Mechanical, Plumbing and Electrical elements. 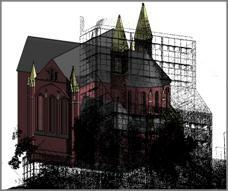 During the Scan to BIM process, point clouds composed by millions of data points previously obtained during a 3D laser scanning session on site are converted into accurate 3D Architectural and MEP BIM models which reflect exactly what has actually been built, providing all geometry and data needed for as-built, renovation and documentation purposes.